The NBA seems ready to rescind its one and done rule. That is good news for BC. Since the NBA creatied the one and done, BC hasn't enrolled a single one and done recruit. We've never even been in serious consideration for any one and done recruits. Whether it is admission's expectations, coach's philosophies or recruits' perspectives on BC, it hasn't happened and seems unlikely to happen in the near future. Unfortunately many of our conference rivals have had success with one and dones (Duke primarily). That puts us at a disadvantage in those critical conference games. The very best players are relatively easy to identify (bigger, stronger, faster, etc.). With those four or five best guys not coming to college, the talent disparity between that next level of recruit (call them Tier 2) and Tier 3 (the guys BC usually gets) is not as wide. This empowers programs who can develop and scheme to success. Watching the best players skip college for high school doesn't mean BC will instantly start winning again. But it does shift things enough, that a coach who has good schemes and good development can thrive. Is Jim Christian that guy? That argument is for a different post. BC won a solid home game against Louisville Wednesday night. There was a lot to like (improved play in 2nd half, good Pop post moves, etc) yet the most interesting part of the broadcast might have been the extended discussion of Wynston Tabbs. I mention it because these talking points come from the announce team's interaction with BC coaches and Sports Information. It feels like BC has an excuse ready for this disappointing season and will clearly be emphasizing that if the team finishes strong. Would this team have been better had Tabbs been healthy? Clearly. He is an ACC level player, would have taken some of the pressure off of Bowman and improved our D. Heck he still might give us a boost. No one is promising if or when he will return, but if he is back by the ACC Tourney, BC might pull off some upsets. However, I don't know if Tabbs' injury excuses the play this season. Tabbs played in the loss to IUPUI. He played in the loss to Hartford. I don't know where Jarmond is on Christian. When you read hot seat talk from plugged in guys, I do give it some weight. I wish our challenges were as simple as one player's health. But we all know the issues -- effort, late game management and overall depth. It will take a lot more than one win over Louisville to convince me that this program is one player away. What other ACC schools might make basketball changes this year? This is the third part of a series to look at the future of BC Basketball. Timing is probably the most under appreciated aspect of making a coaching change. There are years when everyone fires their coach and only a few A listers flip, leaving the bridesmaids to go to their C - List. Other times no one fires their coach leaving the few schools that do selecting a better coach than they ever could have expected. It doesn't seem like a bunch of top basketball jobs will open this offseason. But closer to home the ACC could see some change. And if schools make a change, how will that affect BC's potential search? 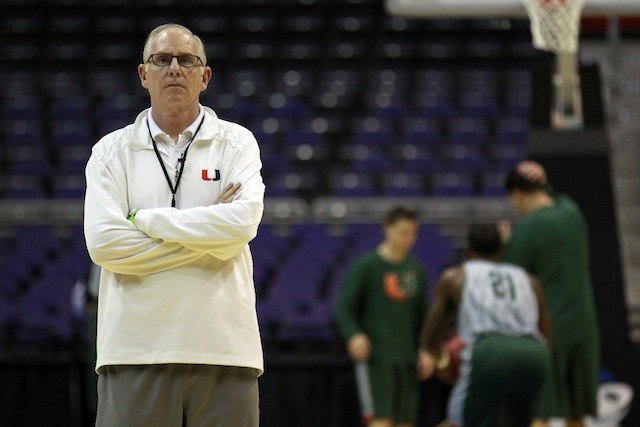 Miami -- Jim Larranaga era of Miami basketball has been one of their better stretches. He has one conference title and four NCAA Tournament appearances. However, he's about to turn 70, the 'Canes are having a rough season and Miami is tied to the most recent NCAA pay for play scandal. I could see Larranage stepping down this year. If Miami does make a change, I could see them looking at the same type of candidates BC would approach. They have some of the same issue (budget, fan support). The unknown in their change is if looming NCAA problems scares coaching candidates away. Clemson -- Can you believe Brad Brownell has been at Clemson nine seasons? I know he has beaten BC plenty of times (including this weekend), but overall this decade of Clemson basketball has been almost as forgettable as BC's -- two NCAA appearances and a losing conference record. The success of the Clemson football team makes this job much more enticing than when Brownell took it a decade ago. The school has more money and more name recognition. If Clemson decided to go all out, they could probably land an elite coaching. Wake Forest -- Danny Manning has been bad at Wake (yet even he got Wake to the tournament once). He's angered donors, fans, AAU coaches and transfers. Wake would love to fire him. The only thing stopping them is his buyout. But if Wake doesn't end the season strong, I think Wake will make a change. If they make a change, I think they would be looking at some of the same names as BC and Miami. I think their job is a little more desirable than BC or Miami's due to fan support and proximity to the other North Carolina schools. Syracuse -- Even before his tragic car accident this weekend, you have to view every Jim Boeheim season as potentially his last. The man is 74 years old. He decided to extend his career to coach his son, but things like the accident might lead him to reevaluate. If he does retire, I just assume Mike Hopkins would take over. In a way that is a loss, since BC could have and probably should have hired Hopkins five years ago. Considering how many players departed and a change in coordinators, Addazio seems pretty confident. The guy wears his emotions on his sleeve so I don't think he is bluffing or puffing up the outlook for recruiting purposes. Maybe he thinks with a healthy Brown, Dillon and the Tight Ends, we will be that much better on offense. Bajakian's candor was refreshing. Not only did he not know Addazio, he didn't know any of the current offensive staffers. In the past, Addazio has clearly put a priority on guys who he knew and worked with at prior jobs. And even when he didn't seem to have a prior working relationship (Reid), there were clearly multiple connections and a clear shared history. That's not the case with Bajakian. I think that's a good thing. This is a critical position and an important year. Had Addazio limited his search to just guys he knew and coaches who are in his direct network, it would have been limiting (see our season with Fitch as OC). The risk is that Addazio and Bajakian don't work well together and never get on the same page. I am willing to take that risk. Addazio clarified how his defensive staff will work. It had been rumored that Reid would retire and Campanile would take over as the sole DC. Clearly that didn't happen as Camp went to Michigan, Reid stayed but in a lessor role and Addazio promoted Sheridan to DC. This will provide a certain amount of continuity. I will break down Sheridan's history as a coordinator later this spring. However, for a guy whose reputation is for X and Os and not necessarily connecting with players, the press interaction didn't change that perception. With Reid still around as the old guy the players like, perhaps Sheridan can just focus on schemes. Sheridan also explained it would still be very collaborative. I hate holding up one game as an example of a whole season or whole era, but BC's loss to NC State Wednesday night was a pretty good example of BC's basketball this year and under Christian. Down 14 in the second half and with Chapman out, the team rallied to take the lead. Then some back and forth with a mix of hustle plays and bonehead mistakes. BC had a chance to win in regulation but a curious iso shot by Bowman (no drive?) missed and we went to OT...and OT was awful. BC couldn't rebound in OT and nothing fell. The final score doesn't even capture how far apart the teams were in those five minutes. NC State had new life and BC was lifeless. The lesson is don't let a good team hang around at home. BC had a chance to put them away in regulation and didn't. Now the rollercoaster moves onto Clemson. The best part of BC Basketball's Sunday wasn't a much needed win. Instead it was seeing the school honor Bill Curley. The 90s star saw a banner hung to the Conte rafters and many of his old teammates to be part of the celebration. On the court BC handled Miami for the most part, although it was a sloppy and ugly game. Miami was very physical, yet the refs weren't blowing whistles constantly. Instead it lead to uneven and chaotic play. Bowman was recovering from the flu and missed lots of shots. Pop, Mitchell and Chapman filled the void. 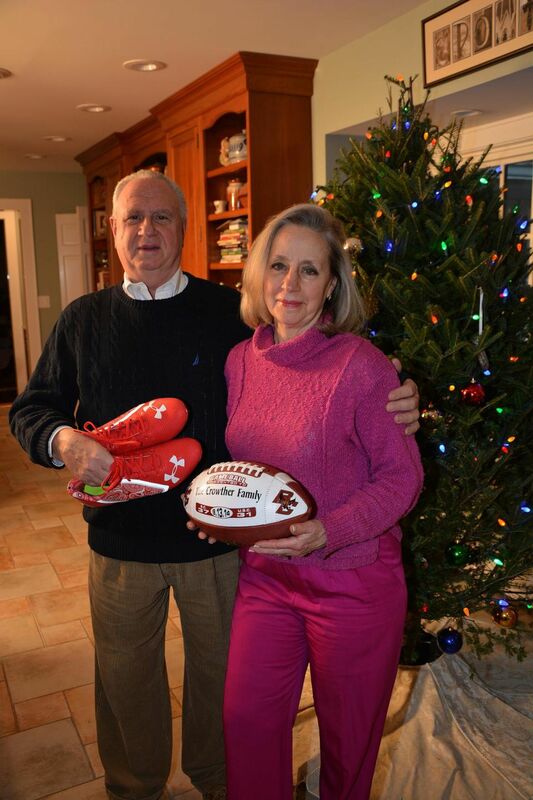 There are many people who aren't BC athletes or coaches, but who are adjacent to BC in some way who become part of the fabric of Boston College. Jefferson Crowther was one of those people. The father of Welles Crowther, Jefferson had become a fixture of the annual Red Bandanna game and a key voice in telling Welles' story. He passed away Wednesday. Like his son, Jefferson's impact will be felt at BC for years to come. Because I came out earlier this year as a Fire Jim Christian guy doesn't mean I want to see BC lose. The win over Pitt was nice, especially given the short bench and fluky injuries again. Hell, if BC goes on some sort of run I might even admit I was wrong. However, I don't think they will win enough games to justify another year of Christian. But for now congrats to all on beating Pitt. Is it finally time to hire Ed Cooley? This is the second part of a series to look at the future of BC Basketball. BC has hired basketball coaches twice since firing Al Skinner. Both times BC could have hired Cooley. (He interviewed during the Donahue process. He supposedly withdrew his name before any interview when BC fired Donahue.) While BC struggles to recruit and win consistently, Cooley has had the best stretch at Providence since the late '80s/early '90s. Cooley is a proven head coach, has strong BC ties and New England ties and can recruit. He would seem to be a no-brainer. Yet there are plenty of BC fans who really dislike the idea of Cooley coming back to BC. The problem with Cooley is two-fold. One he is closely associated with Skinner. That should be a good thing, but others see it as holding onto the past and trying to recreate something that is long gone. The other is the idea is that Cooley is just a recruiter and nothing more. His Providence teams are always talented but lose games they shouldn't and rarely make postseason runs. Cooley has also made very public statements about never wanting to leave Providence and Providence being home, but I think we could still get him to come to BC. It would be expensive, but making the jump to the ACC at a place where he is known would be hard to turn down (this assumes, BC doesn't nickle and dime him on salary, staff and expenses). While I do see Cooley's upside as limited, I would gladly welcome him back. I don't think he would win national championships at BC, but I do think he would have us in the NCAA Tournament every year. Considering where we are now, that sort of winning would be welcome. The consensus best player in the state and one of the best lineman in the country committed to Addazio Tuesday. Kevin Pyne is huge and rated highly by everyone. Given BC and Addazio's track record, he should develop into an elite OLineman. But aside from what he can do on the field, Pyne confirms that Addazio's pitch still works and that the potential lame duck status is not hurting recruiting. Now that Addazio's passed that test, the next hurdle will be how he recruits New Jersey. With Campanile laying the ground work, Addazio picked up lots of New Jersey talent. Let's hope he can do it without his recruiting ace teeing things up. BC announced an extension for Jerry York Tuesday. Of course reactions varied. Some loved the idea. Some hated, but most -- like me -- didn't understand the urgency. In the end, I am not going to take Jarmond to task for extended a BC legend. The Men's program is in a slump, but York has more than earned the right to fix things and leave when he wants. Perhaps the extension will help give elite recruits a little more comfort that they will actually play for York vs his eventual replacement. Does Thad Matta's baggage make him a better or worse fit for BC? This is the start of a series to look at the future of BC Basketball. BC Basketball has a long history of great coaches...Chuck Daley, Tom Davis, Gary Williams and Al Skinner. But other than Bob Cousy, none of the BC greats arrived at The Heights as an established A List name in College Basketball. Now as BC looks to fix its Men's Basketball program, there is an A List candidate floating out there who happens to have a prior working relationship with our Athletic Director. That guy is former Ohio State Coach Thad Matta. But Matta is not a typical elite coach waiting to jump back into the Rat Race. In fact, there are so many issues surrounding Matta, that some wonder if he will ever coach again. Because of Matta's unique circumstances, I don't know if he is realistic for BC, a disaster waiting to happen or just the right guy at the right time. Matta's decline at Ohio State wasn't your typical guy loses touch with age, can't coach, can't recruit stuff, you often find when a long-time winner is fired. He is only 51 and won more than 20 games in 12 of his 13 years in Columbus. Matta's struggles late were primarily due to his health. About a decade ago, he had a failed back surgery that left him with a permanent limp and made sitting, standing and the grind of traveling painful. Although he was fired from Ohio State, it was painted by some in the media as a relief to him. Last year he had the Georgia job. They made an offer and he supposedly accepted (there was even pictures of him at the Athens airport after the interview in all sorts of UGA gear). But before the contract was signed and announced, he turned Georgia down. The narrative was that he and his family had a change of heart. This doesn't sound like a guy who wants to get back into coaching. And more recent articles all paint him as happier and healthier than he's ever been. But the idea that he keeps interviewing for jobs, leads me to believe he hasn't closed the door on coaching forever. Matta moved away from Columbus after he was fired. And supposedly has hard feelings how his final days played out. Clearly there is acrimony with Ohio State AD Gene Smith. But how does he feel about Martin Jarmond? Would his prior working relationship with Jarmond make him and his family feel more comfortable at BC than they would working for a different AD? Also, would Jarmond even want to hire Matta. His mentor clearly felt Matta wasn't not capable of coaching Ohio State. Jarmond would know nearly everything Smith knows about Matta. Would he draw completely different conclusions than his old boss? Matta can coach. He's recruited elite players. He worked at a Catholic school prior to Ohio State. His list of former assistants is beyond impressive and shows he knows how to build a staff. BC could provide access to an elite conference without the immediate pressure cooker that might come from taking a different P5 job. He has never had a losing season as a head coach. As Coach K, Boehiem, and Williams near retirement, he would quickly become one of the most accomplished guys in the conference. There are so many reasons to make this move and spend more money than BC has ever spent on basketball. But...would it even work? If Matta is going to turn BC around, he would need drive, passion and energy. That is not a BC issue. That is a elite basketball issue. If Matta's heart is not in it, this will be a bad experience for both sides. I don't expect Matta to be BC's coach next year. But Martin Jarmond owes it to BC and himself to at least reach out to Matta and see if he is ready to coach again and if coaching at BC makes more sense to him than the other jobs he's considered. What matters: Loss to Cuse, Bowman benching or hot seat talk? Christian announced before the game that Bowman would not start due to undisclosed violation of team rules. I don't know what Bowman did. I don't know if the punishment worked. I do know that this sort of tactic has not been used much by Christian. So why now and why Bowman? This comes off as ineffective at best and desperate at worst. I hope it was worth it, but when the team keeps losing, we don't know. When and how this ends is going to become the most consistent storyline of the next month. Pete Thamel grouped Christian in his coaches hot seat column. He didn't speculate on replacements or a number of wins that would save JC. It seems like the biggest issue is that BC needs to shake its basketball malaise. Thamel is pretty plugged in at BC, so I think this is probably not a great indicator of Christian's future. But the speculation is more interesting than anything happening on the court. Tuesday the final official signing day happened but it wasn't big news for BC. They added one New Jersey lineman. That left BC as the 12th ACC team in Rivals and in 247. But that system has proven meaningless as BC is always 12th or 13th or 14th in the ACC and still finish 7-6. We are not blowing doors off. But the higher ranked ACC recruiting classes aren't either (hello Miami, Florida State and Virginia Tech). Did those teams feel that much more talented than BC? Do they ever? Other than Clemson, there is rarely an ACC team we face where I feel like they have an overwhelming talent advantage. If you are looking for validation that BC has a better feel for their talent needs and development, how about looking at the Combine invites. This also doesn't account for other guys who have a good chance of getting drafted even without the Combine (Jeff Smith). BC is finding and developing talent. I do believe that talent wins. I do believe in bigger stronger faster. But these recruiting systems are flawed and not a perfect predictor of anything. I don't trust Addazio with a clock, but I do trust him looking at high school kids and projecting what they can become. Addazio is also good at managing the roster and is working 5th years right now too. BC's roster will be better than most in the ACC, not the 12th or 14th best. However, there in lies the problem. BC has all these Combine level players, yet can't win at an elite level. That's on Addazio too. He's a great recruiter and a pretty good developer, but he's not a great coach. At seven years, I don't think that is going to change either. I find it interesting that our fanbase reacted differently to Tuesday's loss to Duke vs Saturday's loss to Notre Dame. I don't know if people are checked out or just expect to lose to the stacked Dukies. Here is a tweet from SI's Chris Mannix (a BC guy) after Notre Dame that was echoed around BC sites. But you would hardly find anything that negative or critical after the Duke game, even though BC got killed in the second half. My frustration is that the improved effort of the first half wasn't carried into the second half against Duke. And while I am aware of the talent differences, beyond some good moments of zone in the first half, there was never a feeling that we had any real plan to slow the Duke wave in the second half. There is a month of basketball left and Christian's seat is toasty. My position is clear, but I have no idea what Jarmond thinks. Maybe the angry mob is no longer angry and instead checked out. But in the big picture is that might be worse for BC sports. The good guys beat Harvard Monday night 2-1 to earn a trip to the Beanpot Final next Monday. With all that has happened this year, the Beanpot would be a nice boost and way to build momentum. BC hasn't been in a Beanpot Final since 2016. The guys take on UMass-Lowell before heading back to the Garden next week. Could BC be back in the mix for Kamara? No one said recruiting is easy...for anyone. Take the case of New Jersey LB Mohammad Kamara. He committed to Temple. 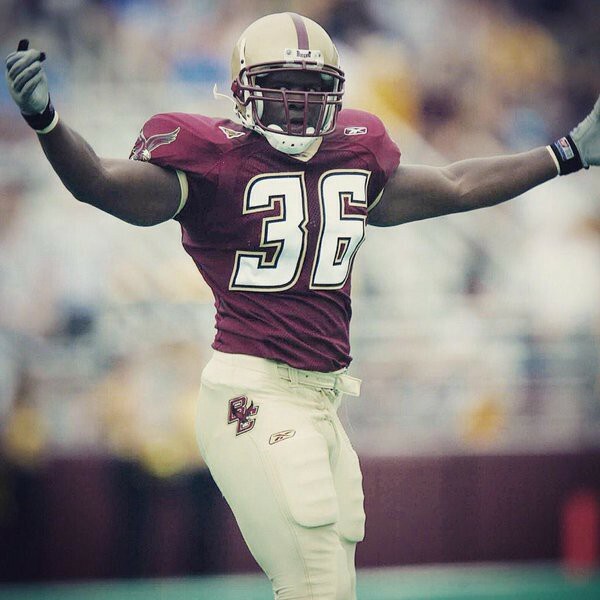 The coach he committed to left, so he opened things up and was close to coming to BC. Temple hired Manny Diaz, so he stayed with Temple. Miami hired Diaz away from Temple and left Kamara high and dry. Now he is signed to Temple and Rob Carey...a coach he had no relationship with. Fortunately Temple is going to release him from his LOI and ask for a waiver for him with the NCAA. This should make him available to any school, including BC. I don't know if he will come back to the Eagles though. I think BC has the space and the need, but our main New Jersey guy -- Anthony Campanile -- is now on a different coaching staff. Kamara should be officially allowed to commit elsewhere in a week. Let's hope BC and he didn't burn any bridges.